Portuguese is one of the most beautiful, romantic, Latin languages. As the sixth most spoken mother tongue in the world, Portuguese is an excellent choice for your toddler or preschooler.Speaking Portuguese, even if you have no ties to the language and culture, is a marketable skill that will serve your child well in the future. As with English, the country where the language is learned and spoken makes a lot of difference in words, pronunciation, and grammar. The Portuguese spoken in Brazil is so different from European Portuguese that it is often referred to as Brasileiro, according to the website Lexiophiles. There are many reasons for these differences and here are two of the most obvious ones. In Brazilian Portuguese American Indian tribal languages donated many of the words for local foods, plants, and animals, as well as other objects. These words are unknown to speakers of European Portuguese. Italian, French, and African languages such as Yoruba, have also found their way into Brasileiro. These add a significant contribution to the vocabulary of Brazilian Portuguese that does not exist in European Portuguese. Brasileiro is more musical or lyrical than European Portuguese. Vowels are more open than those in European Portuguese and to English speakers, European Portuguese can sound somewhat muffled. Brasileiro is syllable-timed like Spanish with equal stress on all syllables. And European Portuguese is stress-timed, with stressed and unstressed syllables in words, which is more familiar to native English speakers. Little Pim’s language courses for young children make learning Portuguese an exciting, playful, and educational experience for your child. She will learn 180 Portuguese words and phrases to start her on a lifelong path of bilingualism. 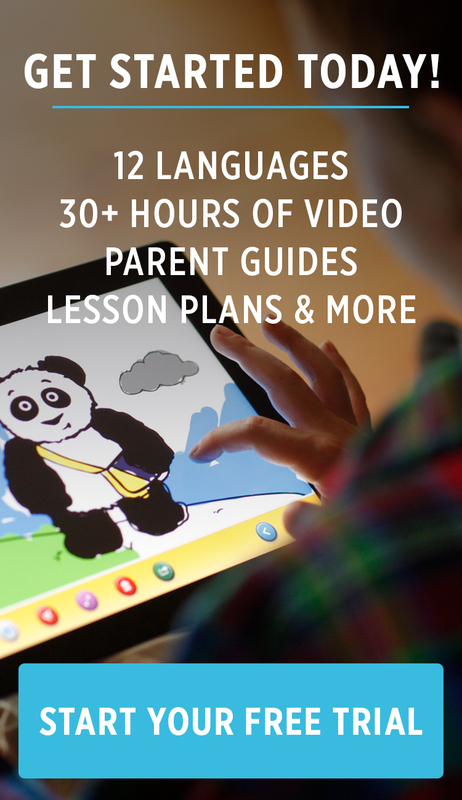 Browse our website for more information on Portuguese language learning for your child. The biggest sporting event in the world, The World Cup of soccer (or football as it’s referred to in most countries) is about to kick off in the South American country of Brazil! To help you get ready for this month-long international sports tournament, we’ve rounded up a helpful list of Portuguese futebol (soccer) terms and a fun word search so you can say Let’s play soccer! Vamos jogar futebol! Click image to download our free World Cup 2014 word search! The Portuguese Complete Set is Finally Here! Orders will start shipping on October 15th, but if you've been waiting for this day, why wait any longer? Before you know it, your kids could be asking, "Outra Vez!" Each Portuguese Complete Set includes the first volume of Little Pim DVDs ("eating and drinking," "wake up smiling," and "playtime"), the brand new Portuguese flashcards, a colorful multi-lingual poster, and the classic, soft Little Pim plush. To start a little smaller with your child's learning, the Discovery Set is also available for pre-order in Portuguese. This is a magical time for new products, so stay tuned for more exciting announcements!